The annual Stu and the Kids Fundraiser returns to Vibiana on Sunday afternoon, July 30th. Stuart Skversky is the Executive Director/Founder of Stu and the Kids and the Host Chefs at Vibiana are Neal and Amy Fraser the principals of Redbird. Proceeds will fund scholarships for at-risk Hill Tribe kids in Chaing Mai. Thailand. Last year’s Benefit raised an impressive $110,000! In 2009, Stuart Skversky, a graduate of the Culinary Institute of America and a rising- star chef, made a dramatic life change by giving up a promising chef career in Los Angeles to move to Chiang Mai, becoming a full-time volunteer at the Wat Dan Chan (a local Buddhist temple), teaching local children English, cooking and baking. Recognizing a need to help prepare these high-risk Hill Tribe kids following their graduation, he founded Stu and the Kids to better prepare them for adulthood, helping them get into a university or technical college and giving them the tools for an independent future. Proceeds from this event go directly to the children’s education, school uniforms, supplies, housing, food and tuition for higher education. Now in their ninth year of fundraising throughout the world, Stu and the Kids has raised over $300,000 for the charity, including last year’s astounding record of $110,000 accumulated from the LA festival, fundraising on the east coast and online donations during 2016. Stu and the Kids supervise seventeen kids, including fifteen who have earned four-year scholarships to university and a seven and fourteen-year-old that is supported with rent and food due to family hardship. The charity hopes to increase the awards to twelve four-year university scholarships in the coming year. In 2009, Stuart Skversky, a Los Angeles rising star chef, gave up his life in Los Angeles and moved to Chiang Mai, Thailand to become a full time volunteer at the Wat Dan Chan (a local Buddhist temple), teaching local children English, cooking and baking. Recognizing a need to help prepare these high risk Hill Tribe kids following their graduation, he founded Stu and the Kids to better prepare them for adulthood, helping them get into a university or technical college and giving them the tools for an independent future. Stu and the Kids’ 2016 Los Angeles Fundraiser was at Vibiana on July 31st. Chef Stuart Skversky is our guest. Proceeds from this event go directly to the children’s education, school uniforms, supplies, housing, food and tuition for higher education. Now in their eighth year of fundraising throughout the world, Stu and the Kids has raised over $165,000 for the charity, including last year’s record of $52,000 accumulated from the LA festival, fundraising on the east coast and online donations during 2015. Participants for this year’s event include Hosts Neal and Amy Fraser, Redbird; Andy Ricker and Thomas Boyce, Pok Pok LA; Eric Greenspan, Mare; Brooke Williamson and Nick Roberts, Playa Provisions; Akasha Richmond, Sambar; Daniel Elkins and Erez Levy, Savore Catering; Ramon Reyes, The Ensaymada Project; Gilberto Cetina, Chicken Itza; Walter Manzke, Republique; Warren Schwartz and Rosa Schwartz, Magpie’s; Ted Hopson, The Bellwether; Gregg Wiele, Patina Restaurant Group; James Tree and Carlos Enrique, Superba Food & Bread; Gary Menes, Le Comptoir; and Jason Neroni, Rose Café. Danielle Chang, the founder of the series of LUCKYRICE Night Markets staged across the country, is back with us to preview the upcoming Las Vegas evening at The Cosmopolitan Las Vegas set for Saturday, October 4th. In 2014 LUCKYRICE has already visited New York, Los Angeles, and San Francisco. Griffin Hammond, a past guest on the show, is a respected filmmaker. He’s just completed his fascinating film on Sriracha. This documentary has taken him to Southern California on multiple occasions and even to Thailand where Sriracha originated. In Thailand the people are amazed that Sriracha is a popular condiment in the United States. In Thailand it’s used on fish and eggs and doesn’t have a cult following. Griffin financed this unusual documentary via an incredibly successful Kickstarter campaign that was actually way oversubscribed. On Wednesday, December 11th “Sriracha” will be released to the public online. If you love Sriracha or just wonder what all the fuss is about this is a must-see for you! Just how popular is the domestic version of Sriracha? In 2012 they sold 20 million bottles with the green cap and the red rooster on the label! That’s an incredible 100 million pounds of peppers used in the sauce. As we complete our 14th month on the air with the “SoCal Restaurant Show” with Jet Tila we want to again thank our loyal listeners and sponsors for their enthusiasm and support. We wouldn’t be here without you and we never forget that. Thanks to positive listener feedback Jet has a new segment on Friday morning. Be sure to tune in Friday mornings at 7:50 a.m. for “What’s Cooking with Travis and Chef Jet Tila” on the “Travis Rodgers Show.” Jet talks with Travis about food and cooking from the dude’s perspective. It’s on the lighter side and you won’t hear this AM 830 KLAA exclusive feature elsewhere. Chef & Restaurateur Suzanne Goin is true culinary royalty in Los Angeles. She has just published her second cookbook, the A.O.C. Cookbook. It was a two year process. Suzanne is the recipient of the James Beard Award for Outstanding Chef: California (2006) and is a multiple past nominee. She worked for Alice Waters at Chez Panisse earlier in her career. Her final position at Campanile (now closed) in Hollywood (before going out on her own) was as executive chef. Suzanne partnered with sommelier, Caroline Styne, to open Lucques in West Hollywood in 1998. That was followed by A.O.C. in 2002. Next was Tavern and The Larder in Brentwood. The President has dined at Tavern. A new Larder is soon to open in January at The Tom Bradley International Terminal at Los Angeles International Airport. Suzanne talks about cooking with seasonal vegetables and how that passion of hers found its way into the A.O.C. Cookbook. She feels it’s very important to balance flavors which you only learn by tasting. All the recipes in the cookbook were tested in a home kitchen by an enthusiastic home cook. Suzanne’s long-time business partner, Caroline Styne, has wonderfully informative wine notes that go with each recipe in the book. A.O.C. (the restaurant) has recently moved a mile West to the old Orso location on W. Third Street across from Cedars-Sinai Medical Center. Suzanne shares how the move came about. Griffin Hammond is a respected documentary filmmaker. He’s just completed his fascinating film on Sriracha. This documentary has taken him to Southern California on multiple occasions and even to Thailand where Sriracha originated. In Thailand the people are amazed that Sriracha is a popular condiment in the United States. Griffin financed this unusual documentary via an incredibly successful Kickstarter campaign that was actually oversubscribed. Chef Instructor Robert Wemischner is a mainstay in the Baking Department at L.A. Trade Tech in Downtown Los Angeles. He’s also an accomplished pastry chef and author. The Dessert Architect is his most recent title. Chef Bob shares his holiday dessert ideas for using fresh pomegranates, persimmons, and (the underappreciated) quince. In Newport Beach Pascal also operates Brasserie Pascal in Fashion Island and Café Jardin. How the French celebrate the Christmas meal is also part of the conversation. Gavin Kaysen is the greatly respected Executive Chef and Director of Culinary Operations for Daniel Boulud’s Café Boulud in New York, Palm Beach and Toronto. He put previously San Diego on the national culinary map during his much-praised tenure at El Bizcocho at the Rancho Bernardo Inn. Fortunately for us he finds his way back to SoCal periodically to cook at fundraisers. In his spare time he’s the Head Coach for Bocuse d’Or Team USA 2015. Chef Gavin has completed in this prestigious International Culinary Olympics and explains what the level of competition is all about. It’s a year of rigorous practice. Go Team USA in 2015! Earlier in the month the food world lost Chef Charlie Trotter who was the first superstar celebrity chef in Chicago and influenced a network of young chefs. Charlie Trotter’s (the restaurant) on W. Armitage was known to foodies around the world for his innovative tasting menus and brilliant wine cellar. Our own David LeFevre, the executive chef & partner of both MB Post and Fishing with Dynamite in Manhattan Beach worked for Charlie over a period of ten years in a couple of stints. David joins us to share memories of the real Charlie Trotter. Fortunately his legacy will live on. Randy Clemens, noted food journalist and author of the best-selling Sriracha Cookbook and The Veggie-Lover’s Sriracha Cookbook, both from Ten Speed Press. Randy was just in Thailand in Sri Racha in the Chonburi Province researching the unusual origins of Sriracha and shared this rich history with us. The original Thai version of Sriracha varies considerably from what we know stateside as the ubiquitous product from Huy Fong Foods, Inc. with the green cap and red rooster on the label. We chatted with him from the Canary Islands. Also an intriguing dash of restaurant and food chat. Mark Sunday afternoon, September 29th on your calendar. Our very own Jet Tila is hosting the Thai 2013 Food Festival at Paramount Pictures Studios in the heart of Hollywood. It starts at 3:00 p.m.
Celebrity chefs and outstanding local Thai chefs will be there presenting their signature dishes for the guests to sample and enjoy. Entertainment will include music, Thai dancers, and fruit carving. Randy was just in Thailand in Sri Racha in the Chonburi Province researching the unusual origins of Sriracha and shares this rich history with us. Executive Chef Vernon Cardenas oversees the kitchen at the just-opened State Social House on the fabled Sunset Strip. He has extensive experience cooking locally including his tenure as opening chef at Katana, also on the Sunset Strip. Chef Vernon is an expert on all things Sake. He presents a overview course in Sake Appreciation 411. Biff Naylor is a veteran restaurateur on the SoCal restaurant scene. He previously owned Tiny Naylor’s and Biff’s. In 2004 Naylor came out of a brief retirement to purchase and revive the surviving Du-par’s Restaurants & Bakeries. The first location at The Original Farmers Market (opened in 1938) remains after a massive renovation and needed refurbishment. They are particularly well-known for incredible pancakes and house-baked fruit pies. The Naylor Family represents three generations of career hospitality folks. Daughter, Jennifer, was the executive chef for many years at Wolfgang Puck’s Granita in Malibu. One of Jennifer’s key chefs is now the corporate executive chef for Du-Par’s. Most everything is made from scratch using premium ingredients. If you sit at the counter at a Du-par’s you’ll see servers squeezing the fresh orange juice to order. There is even a very busy Du-par’s in Downtown Las Vegas in the Golden Gate Casino & Hotel. They are famous for their ever popular “to-go” chilled shrimp cocktail which is actually a clever loss-leader designed to attract guests to the casino. Jet Tila provides a useful tutorial on the types of soy sauce and their uses. There are differences in flavor and texture between Chinese, Japanese, Korean, and Thai soy sauces. Light soy sauce, for example, does not have reduced salt. It’s actually saltier than the darker version. Kedric Francis the Executive Editor of both Coast Magazine and The Orange County Register Magazine is back with us with his regular travel segment. Kedric is talking about a September craft beer cruise to Hawaii (Ensenada to Hawaii) as well as other upcoming craft beer cruises. He also previews a new luxury Montage Hotel in Maui arriving in 2014. From there it’s some standout travel options in Southern California. 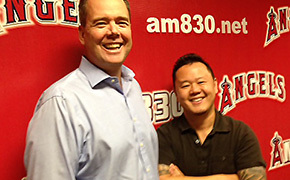 Martin Riese, the General Manager of Ray’s & Stark Bar at The Los Angeles County Museum of Art on the Miracle Mile, joins us. Martin is Los Angeles only certified Water Sommelier. During his time managing fine-dining restaurants in Germany (before returning to Los Angeles) he researched and wrote the definitive guidebook to mineral waters around the world. At Ray’s he has just launched their first Water Menu with some twenty selections from around the world. It’s a great alternative for guests who want a festive beverage to pair with their meal but perhaps need to stay away from alcohol. Jenny Ross is the executive chef and proprietress of the 118 Degrees Community Cafes in Costa Mesa, Anaheim, and Laguna Niguel. The original location at The Camp in Costa Mesa recently celebrated its 7-Year Anniversary. Chef Jenny characterizes her food as fresh, organic living cuisine. The line of Jenny Ross Living Foods can be found pre-packaged in the grocery section of select Whole Foods Markets. Her soon to be published 3rd cookbook is Healing with Raw Living Food. Barbara had a long tenure with the Los Angeles Times as a senior food staff writer. She specializes in the cuisines of India, Thailand, Korea, Mexico and South America. She currently writes for the “Squid Ink” blog for the LA Weekly and has two of her own food, wine, and travel blogs: Table Conversation and EatMX.com. She just completed the Korean Restaurant Guide Los Angeles for the Korean Food Foundation. 40 restaurants in Los Angeles and Orange County are profiled. The book will eventually be available for downloading on a website but is currently available as a free app for both iPhones and Android phones. One of the highlights of visiting the 8th Annual Travel & Adventure Show in Long Beach on January 13th was stumbling across Trip Feast, who was exhibiting there. They are based in London. The boutique firm organizes small group tours with a insider’s culinary twist. You actually cook with chefs from the visited country learning the secrets of the local cuisine. You can even dine in small groups at the homes of locals. Food and drink is very much an integral part of the travel experience and Trip Feast visits countries with a rich culinary heritage. Featured countries (with new stops in development) are India, Thailand, Vietnam, Malaysia, Philippines, China, Mexico, South Africa, Portugal, Ireland, Serbia, Morocco, and Lebanon.